CONTACT THE OWNER - ENQUIRE NOW ABOUT ID: 33046 - CLICK HERE ! Warm and inviting house, almost 500 Sq feet, with world class views of Lake Nahuel Huapi, Island Victoria, the Andes and Chile. 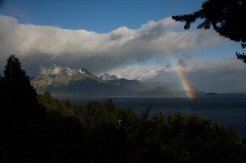 Sunny and private, parking for 2 cars, 2 minute walk from bus stop (runs every 20 minutes), minutes from many incredible hiking trails, 25 minutes from downtown Bariloche and 20 minutes to Cerro Catedral ski area. 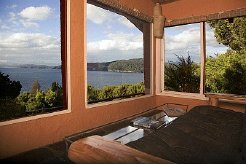 Wood stove including firewood , gas heater, queen bed, dining room table with chairs, futon, safety deposit box, fully equipped kitchen, private patio with parrilla. 29" TV with Direct TV, DVD/MP3 player, high speed wireless internet, Skype phone for unlimited international phone calls; sleeps and equipped for two to four people. This is a very special and peaceful location!